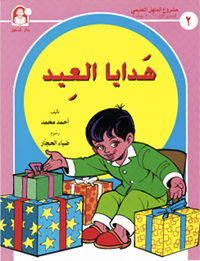 The second book in Al-Manhal’s set of stories for children learning Arabic is called هَدايا الْعِيد hadaayaa l-ʕiid ‘holiday gifts’. Although it is only the second book, it is actually quite more sophisticated than the first book. In it, you will learn about the gifts that Omar did and didn’t get on the first day of Eid al-Fitr, the Islamic holiday marking the end of the month of Ramadan. I have prepared this vocabulary list, which will help you work through the book. The book can be purchased directly from Al-Manhal here. You can also download a PDF of the book from here. Within certain PDF viewers (but not all PDF viewers!) you can listen to embedded audio by clicking on the text.